Barrow Lodge No 3928 welcomed Assistant Provincial Grand Master David Grainger to their meeting at Barrow-in-Furness Masonic Hall. The reason David assigned for this most friendly of visits was to help the brethren to celebrate the fact that lodge stalwart Oliver Chalker had reached his diamond jubilee as a Freemason. 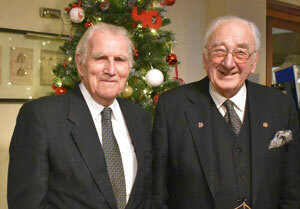 Jack Beckett (left) and Oliver Chalker. Oliver is a past Chairman and President of Barrow Masonic Hall, Oliver is well known and respected throughout the Furness and South Lakeland Group and indeed much farther afield. His service to Masonry was recognised by him having been appointed to the rank of Past Assistant Grand Director of Ceremonies in 1995. A resume of Oliver’s personal life and Masonic career was orated by David who did so with obvious pleasure, the celebrant is someone he regards as a friend and who has provided him with many a guiding hand during his own distinguished journey through the Craft. Oliver had spent most of his working life in the family wholesale fruit and vegetable business. In his spare time, he bred poultry, particularly the leghorn breed, and was an internationally acclaimed judge who was much in demand at poultry shows. He is the president of the Leghorn Club. Having been in his prime at the time of national service, Oliver was called up and rather than the medical corps he was hoping to join, he found himself posted to the Military Police. His first posting as a Red Cap, albeit for only a week, was to the Tower of London. This was his first visit to the nation’s capital and when he was told to drive a lorry to Woolwich he obeyed the order but did not even know in which direction Woolwich lay. Using his initiative, he spotted a bus which had Woolwich shown as its destination and followed it, stop by stop, until he found the location of the barracks. On his demob, the family had moved to Blackburn where they had a branch of the firm with others at Darwen and Bolton. Oliver returned to Barrow to look after that branch. Following the oration, group chairman Peter Schofield read the citation from the Provincial Grand Master Tony Harrison acknowledging the 60-year milestone before it was presented by David. On behalf of the group Peter presented Oliver with a 60 year lapel badge. The celebratory meal was enjoyed by 80 diners with the toast to Oliver’s health being proposed in humorous style by Jack Beckett, his friend of many years. A raffle raised £500 with £250 of this, at Oliver’s request, being directed to the local Salvation Army. Amongst the interested spectators was former lodge member Roger Flitcroft. Roger had left Barrow, originally for Preston, aged 18 years but had joined Barrow Lodge as his father, a borough surveyor, and brother were members. He regularly made the journey up to Barrow for meetings until his resignation in 1996. A member of an East Lancashire lodge he now holds grand rank. 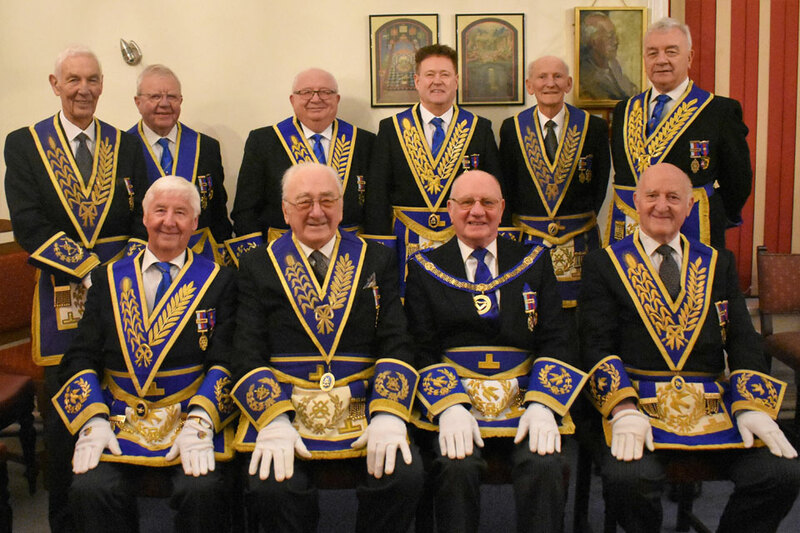 The reason he had attended this particular meeting was to mark the fact that it had been 50 years to the very day since he had been initiated and joined Barrow Lodge. His 50 years celebration will be held in January at his East Lancashire lodge. Pictured from left to right standing, are: Ralph Walker, Keith Kemp, John Quiggin, Peter Schofield, Roger Flitcroft and Barrie Crossley. Seated are: Jim Wilson, Oliver Chalker, David Grainger and Rowly Saunders.